What is Chiyomaru Studio? It’s basically 5pb, founded by executive director Chiyomaru Shikura. Mages is the parent umbrella company. That out of the way, let’s look at its announcement of new projects during the recent “Chiyomaru Studio Live 2017: Genesis” event. The one thing all game projects have in common is the semicolon in their titles. No more skulking in the shadows for that punctuation paragon! I have already covered the release of Chaos;Child for PlayStation 4 and PS Vita in the West; an Android version will launch via the Google Play store in Japan on May 28. Now let’s look at the elephant in the room: Steins;Gate Elite. This is not a new game, but what sounds to me like an updated version with some new content as well. This begs the question: does a perfect game need an overhaul? What if these “new elements” become pimples on the face of digital beauty? It’s probably obvious, but I am highly sceptical. I have no inkling what drove Chiyomaru/5pb to consider an update, unless it’s simply an attempt to extend the game’s reach and longevity. I would say it’s therefore highly likely this new version will be localised. All right now elephant: exit stage left. This leaves three genuinely new announcements. 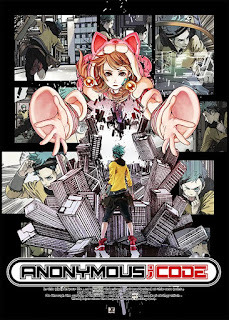 Anonymous;Code is a visual novel about hacking and employs the concept of infinitely expanding vertical world layers (in contrast to Steins;Gate’s horizontal world lines). The game will be released for PS4, PS Vita, and Nintendo Switch. Occultic;Nine was written by Chiyomaru Shikura as a light novel series. It is coming out in Japan on September 28 for PS4, PS Vita, and Xbox One. Finally, Robotics;Notes Dash, a sequel to Robotics;Notes, was announced, but it seems unlikely we’ll get either of those. I would pin some tentative hope on Anonymous;Code as a likely candidate for localisation. Chiyomaru intends to release all its titles on Steam eventually. Some games let you fight monsters, some games let you farm crops; Sakuna: Of Rice and Ruin will let you do both when it comes out next year. Sakuna combines platforming, action, and RPG mechanics with farming simulation in a story based on Japanese mythology – a stark departure from developer Edelweiss’ previous game, Astebreed. Sakuna: Of Rice and Ruin casts players as Sakuna, a lonely harvest goddess who’s been banished to an island of human outcasts and demons. Armed with trusty garden tools and a magical scarf that lets her grapple distant enemies and platforms, Sakuna fights to tame the island, while her agricultural skill lets her hone her combat abilities and craft new items and equipment. That’s a familiar premise, but Edelweiss is looking to set Sakuna apart with a story that’s described by publisher XSEED as “an ode to the artistry of cultivating rice” and “a love letter to Japanese culture.” Japanese agriculture is steeped in tradition; that’s something that’s typically dealt with subtly (or not at all) in farming games, but Sakuna aims to make this a focal point. I’m very much looking forward to playing it when it comes out for PC and PlayStation 4 in 2018. In a move to reveal more information about the service prior to E3, Nintendo has announced that its paid premium online service will launch in 2018. This means that for the rest of the 2017, games will continue to have free online access. Nintendo still plans to launch some of the premium services this year with the company revealing that its mobile lobby and chat application will be available to download this season with limited functionality. The classic games library has also expanded from the original announcement. Instead of renting one title per month it now covers a library of titles with expanded online multiplayer. Super Mario Bros. 3, Balloon Fight, and Dr. Mario have been announced as key titles the service will contain. Outside of the reveal that the service has been delayed, Nintendo has also announced its pricing. The American online service page was the first to be updated, which revealed the pricing of a year-long membership being to $19.99 USD. The service will also have a one-month membership for $3.99 USD and a three-month membership for $7.99 USD. Nintendo has also updated the Switch Online information page for other regions, including Australia ($29.95 for one year, $11.95 for three months, and $5.95 for one month). Developer Supergiant Games has had Pyre in development for nearly three years; it's the biggest game it has created so far, eclipsing both Bastion and Transistor. I’ve been excited for this game ever since I saw the reveal trailer at E3 2016, and you can watch it below – there is no updated trailer as of yet. Pyre will come to PlayStation 4 via the PlayStation Store and PC via Steam on July 25. Pyre is set in a mystical purgatory, a world called Downside, where the exiles form teams of three characters at a time to engage in battles in an ancient competition called the Rites. Rites consist of tactical maps where the objective is to extinguish the opponent’s flame before they get to yours. You can equip your chosen team members with powerful Talismans and Masteries. Ultimately, you hope to reach redemption and thus earn your freedom. On top of the single-player campaign, Pyre also offers a local two-player versus mode. Let’s hope the battle mechanics play as exciting as they look! A defining feature of Pyre is the absence of conventional Game Over screens. Rather, each Rite battle outcome will open up its own branching storyline – in other words, your journey will always continue, in one way or another. In keeping with Supergiant’s design philosophy, the hand-painted artwork is richly atmospheric and the music has again been composed by its audio director, Darren Korb. I have no doubt that Pyre will be a feast both for eyes and ears, and I’m thrilled that there appears to be another voice-over narrator. Rather than a boring voice droning away, Supergiant knows how to integrate the narrator as a force who helps to instantly bring the story alive.